Scribner. PAPERBACK. 1416547916 Item in very good condition! Textbooks may not include supplemental items i.e. CDs, access codes etc... . Very Good. Scribner. Paperback. POOR. Noticeably used book. Heavy wear to cover. Pages contain marginal notes, underlining, and or highlighting. Possible ex library copy, with all the markings/stickers of that library. Accessories such as CD, codes, toys, and dust jackets may not be included. Scribner, 2011. Paperback. Good. Disclaimer:A copy that has been read, but remains in clean condition. All pages are intact, and the cover is intact. The spine may show signs of wear. Pages can include limited notes and highlighting, and the copy can include previous owner inscriptions. At ThriftBooks, our motto is: Read More, Spend Less.Dust jacket quality is not guaranteed. Scribner, 2011. Paperback. Acceptable. Disclaimer:A readable copy. All pages are intact, and the cover is intact. Pages can include considerable notes-in pen or highlighter-but the notes cannot obscure the text. At ThriftBooks, our motto is: Read More, Spend Less.Dust jacket quality is not guaranteed. Scribner. Used - Acceptable. Shows definite wear, and perhaps considerable marking on inside. Scribner. Used - Good. Shows some signs of wear, and may have some markings on the inside. Scribner, 2011-03-01. Reprint. Paperback. Very Good. NY: Scribner, 2010. 1st paperback printing with number 1 in copyright line. Vg showing light cover wear no markings.. 1st. Paperback. VG. 8vo - over 7¾" - 10" Tall. Scribner. PAPERBACK. 1416547916 Minor shelf wear . Very Good. Scribner. PAPERBACK. 1416547916 signs of little wear on the cover. . Very Good. Scribner. Paperback. 1416547916 Unused Like New . Fine. 2011-03-01. Reprint. Scribner. Paperback. 1416547916 . New. 2011-03-01. Reprint. Scribner. PAPERBACK. 1416547916 . New. Scribner. PAPERBACK. 1416547916 A very nice looking book. No creasing, soiling, or writing. Tightly bound. Has remainder mark. Cover has minor wear. . Very Good. U S. A.: Scribner. Fine. 2011. First Thus. Softcover. 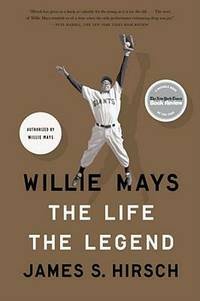 1416547916 628pp including bibliography and index Photographs Authorized by Willie Mays Great biography of one of the best players in baseball history . Scribner. Used - Good. Good condition.